The Shire pent shiplap shed is created with high quality Northern European Pine cladding. This not only gives it an incredible weather resistant build, but it also looks fantastic too. The very large glass joiner window is a particularly good feature, allowing in a high level of light and also adding to its overall aesthetically pleasing design. The pent roof ensures the shed offers excellent interior space, whilst benefitting from a great compact exterior. As it slopes down towards the back of the shed, it allows you to erect it underneath trees or against buildings, bushes and fences. It also benefits from a modular design which means you can change the position of the door and the window if preferred. With a cosy golden brown finish, the shed has been basecoat treated at the factory, though it does still need to be treated each year so that it offers long lasting weather protection. Although inside the shed you’ll find a less sturdy solid sheet construction, we are impressed by the robust framing. 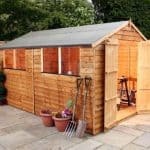 The manufacturers have used some cost-saving techniques, but overall you are buying a very reliable and durable shed. It’s not hard to see why the Shire range is popular with customers. This model has a very nice design and will complement the style of any garden. We’re not a huge fan of solid sheet floors, but they are strong enough to hold up to medium weight equipment. 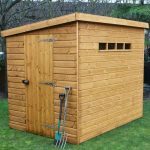 This Shire pent shed is a great medium size storage building with a good amount of width and depth. 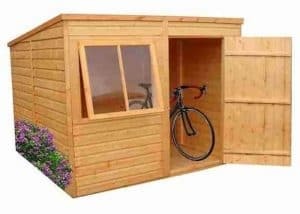 Pent sheds don’t tend to offer much depth so it’s refreshing to see one that will comfortably fit a bicycle inside for example. 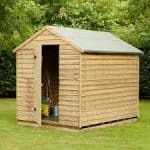 It comes with a standard width door, though compared to some other sheds in the Shire collection, the height of the door is a little taller. You’ll still need to duck to enter the shed if you’re over 5’5”, but inside it benefits from a large height at the front of the building. That’s one other thing pent sheds have that apex ones don’t – a shorter rear than front. This model uses a pent roof which slopes down towards the back of the building. This is actually a very clever design as it increases your options of where you can assemble it. For example, it’s ideal for erecting under trees with low hanging branches, or in front of garden fences. You can’t really tell from the picture, but the shed floor is constructed from solid sheet materials, just like the roof. This is disappointing as it limits what you can store. Solid sheet isn’t the strongest type of floor available and therefore it will not withstand anything which weighs a lot. Bicycles, watering cans, plastic lawnmowers and small tools and equipment are what the shed is mainly designed to hold. 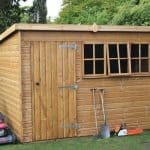 This is one of the more robust looking pent sheds thanks to its exceptional quality Shiplap tongue and groove cladding. There are quite a few benefits that come with this cladding style, including high weatherproof protection and a strong, secure and visually pleasing design. It has a very smooth look and just by looking at it you know you are getting an excellent quality building. Tongue and groove cladding is much more resistant to warping than overlap. This means even if placed in a sunny area with a lot of direct sunlight, providing you use a good quality preservative the chances of warping are minimal. 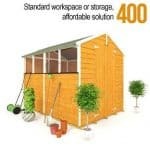 What’s more, the shed comes with a robust 34mm x 34mm frame. So both inside and outside, the shed has an extraordinarily tough build. Like many of the sheds offered by Shed Store, this one is basecoat treated. So you are reassured that it is protected whilst in transit. However, this is one of the weakest types of treatments so you will still be required to treat it again after installation and then every year for maximum protection. The first thing you will notice about the single door on this pent shed is its width. Though it comes with a standard width measurement, it appears wider than a lot of the doors found on competitor sheds. We would like to have seen some bracing added to the door, but if you have a few DIY skills this wouldn’t actually be hard to do yourself. Without bracing there is the possibility that it could sag through heavy use. A hasp and staple stops the door opening when not in use, though you will need to buy a padlock to secure the shed. Whilst the door could be improved, we are impressed by the window. It boasts a great 2-in-1 design. This means it looks like two windows, but it operates as one. 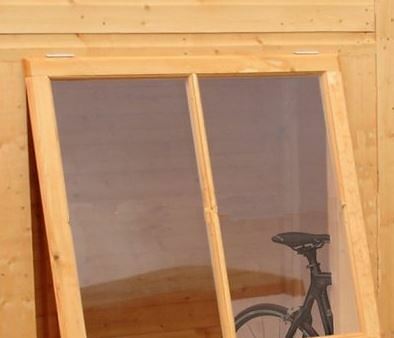 It is constructed from 3mm glass which offers great insulation, whilst the fact that you can open it also enables you to ventilate the shed in the warmer months. Both the window and the door can be positioned differently to how they are shown on the picture. This is thanks to its interchangeable sides and it gives you great flexibility and convenience. As this is one of the more affordable sheds in the Shire range, it doesn’t focus too much on security or privacy. The fact it has a hasp and staple rather than a pad bolt does give it a slightly better quality design. However, it doesn’t add to its security so you will need to buy a padlock; particularly if your garden isn’t secure. The double window also compromises privacy so we’d definitely recommend adding either a blind or curtains to stop anybody peering into the shed. 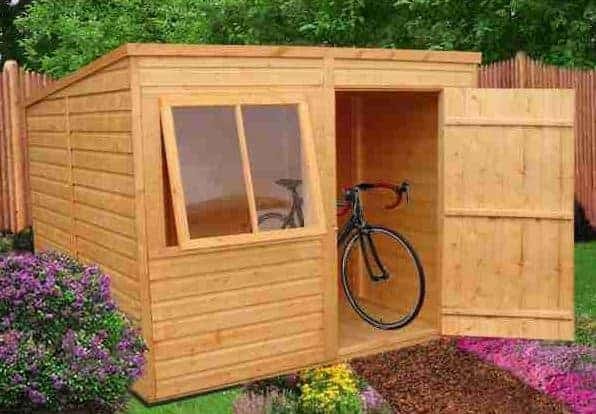 This is one of the few sheds that doesn’t allow you to make any customisation options. The Shed Store also don’t offer any extras. They show a small selection of related products, but we’re surprised they don’t give you the option to buy their high quality alarm padlock. The shed comes with a hasp and staple, but a padlock needs to be bought separately. If you search the Shed Store site you’ll find they offer some really good quality padlocks at pretty decent prices. The alarm padlock for example is designed so that if it is tampered with, a loud alarm will sound, scaring off any potential burglars. We feel this shed has the potential to be a little better in terms of quality. On the plus side it does benefit from Shiplap tongue and groove cladding. However, the solid sheet OSB materials and the unbraced door do lower its quality a little. However, it is still a fantastically reliable building; especially considering its low cost. With regular treatments as recommended, this shed will last for quite a long time. However, you will need to be careful not to store anything too heavy on its floors. We especially like the depth of this shed as it is a lot deeper than the majority of pent sheds found on the market today. This increases what you can actually store in the building. You could also add shelving and hooks to the walls, further improving its storage capabilities. 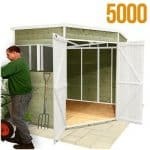 This is a fairly simple shed to assemble and the instructions given are really easy to understand. It is estimated to take you around 4 hours to assemble and it should be erected by two people. Overall this does offer excellent value, even if a few things could be improved upon. It comes at a great cost and the Shiplap cladding really enhances its durability. Final Thoughts: There are a lot of pent sheds available on the market, but few are as robust and attractive as this one. Part of the Shire collection, it is constructed from Northern European Pine which gives it a lighter, more welcoming colouration. The 3mm thick glass window is one of the best features of the building and it offers a lot more natural light than the majority of shed windows thanks to its extra-large design. A hasp and staple has been fitted to the door, but you will need a padlock if you want to make sure it is properly secure.